It's been an eventful few days here. Not only did the remnants of Hurricane Sandy roll through here, but we were lucky enough to be moving furniture in the middle of it. We were too busy to watch TV in the days leading up to the move so didn't know there was bad weather brewing until I got a concerned message from one of the people who offered to help us move. Friend: "Are you still moving in the hurricane?" Friend: "The big one that's on it's way here SATURDAY." Me: "Yes, it's a fixed date commitment. We'll build an ark and float to the house if we have to." I should've known better than to be flippant. I turned on the TV while we packed up some last minute items. The NEWS stations were declaring imminent emergency. 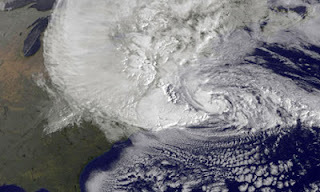 The satellite pics showed a large swirling mass heading our way. It has been raining here since exactly 8:00 am on Saturday morning, which is when hubby picked up the keys to the U-haul. Four days later we are still carrying over car loads of small items and attempting to paint our apartment even though it's 100% humidity outside. Seems as though the rain is doing me in as much as the exhausting work of shifting boxes, cleaning and painting. This morning my Princess Destructo stood and watched the rain at the patio door and said, "Is Noah coming for a visit?" My brain jumped to make a connection, "Oh you mean Noah and the ark? It is raining a lot." *Insert eye roll, huff, and "Mom" drawn out to 2 syllables* "Mom, Noah from 301!" ...Oh yes, the kid from down the hall at our old apartment. Lots of U-Hauls but no arks. The reason why I didn't get to sleep in my bed on Saturday. up in the master bedroom. are furniture and suitcases every where. and miscellaneous items to sort. 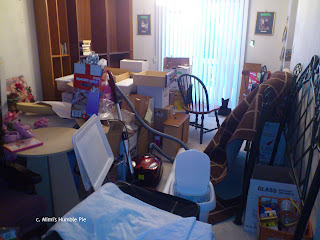 with the overwhelming amount of clothing, kitchen stuff, and paper! This had to be the most unorganized move I've ever done. It's a testament to my busy schedule and being overwhelmed with life. 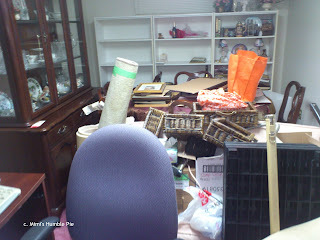 We still have personal belongings from the previous tenants to shift before we can sort out our own stuff. I think I'll hide in bed and eat Halloween candy.